A very special name for a very special sandwich. 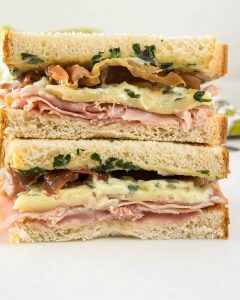 Ham, Melted Brie, Crispy Prosciutto Sandwich with Basil Aioli is a blend of textures and flavors that will tantalize the taste buds. This sandwich tastes like it belongs in a 4-star restaurant but can be put together with just 6 ingredients and 10 minutes. A great sandwich doesn’t have to be difficult to make with a million ingredients and a ton of techniques but it doesn’t hurt if that’s what the people eating it think. They just have to have top notch ingredients exactly like this Ham, Melted Brie, Crispy Prosciutto Sandwich with Basil Aioli. I think my appetite has seasons. 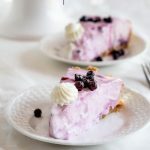 When the worst of winter is over, I start looking forward to meals that we can take outside in the sunshine or enjoy with a nice salad or piece of fruit. 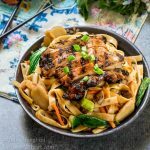 My comfort food leads way to fresh lighter fare. 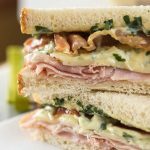 Even though you could make and enjoy this sandwich any time of year, the freshness of the basil with all of the other ingredients just make me look forward to warmer days. I haven’t always been a sandwich person. It’s because the sandwiches that I grew up with started with bread that stuck to the roof of your mouth and were too dry to swallow. You know that I love baking bread, but like everyone else don’t always have the time. That’s when I reach for Pepperidge Farm Farmhouse™ Hearty Sourdough bread. 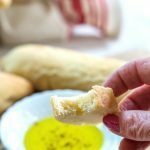 John loves sourdough and I love that they are big and soft and made with wholesome flavorful ingredients just like my homemade bread is. I also love that this isn’t a bread that falls apart as soon as you load it with your other ingredients! 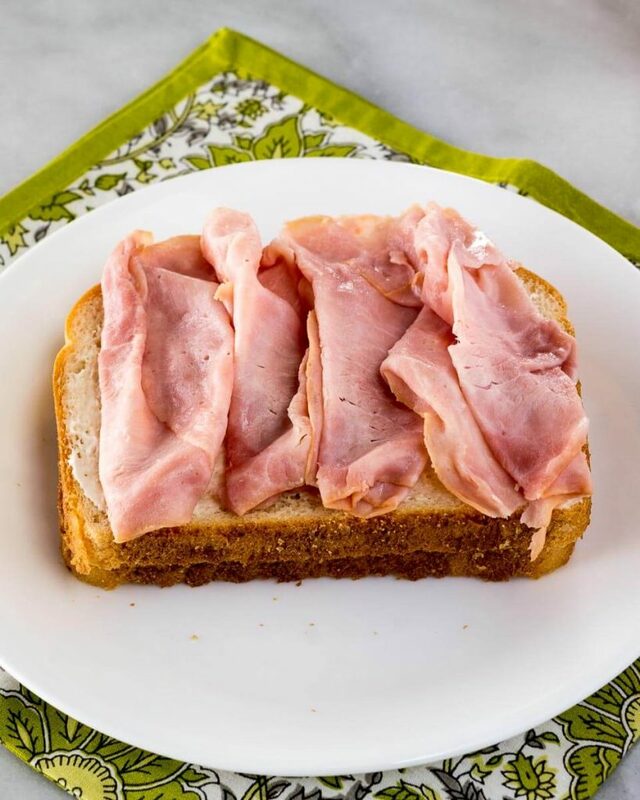 One of the star ingredients of this sandwich is Hillshire Farm® Thin Sliced Honey Ham lunchmeat. 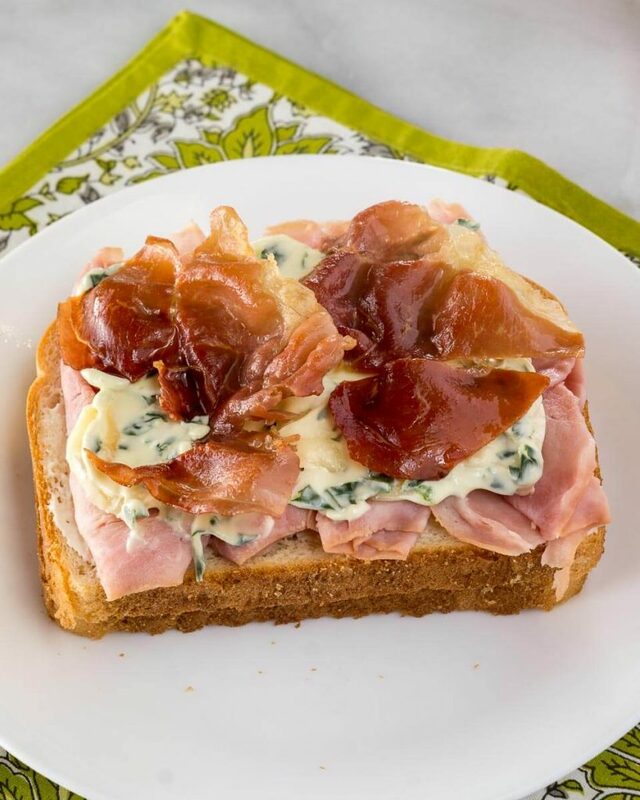 This ham provides a sweetness that is a nice contrast to the sourdough flavor of the bread and the saltiness of the crispy prosciutto. I love that Hillshire Farm® Thin Sliced Honey Ham comes in a resealable container that keeps it fresh and protects it from getting torn up or crushed so every last bit of it gets used. 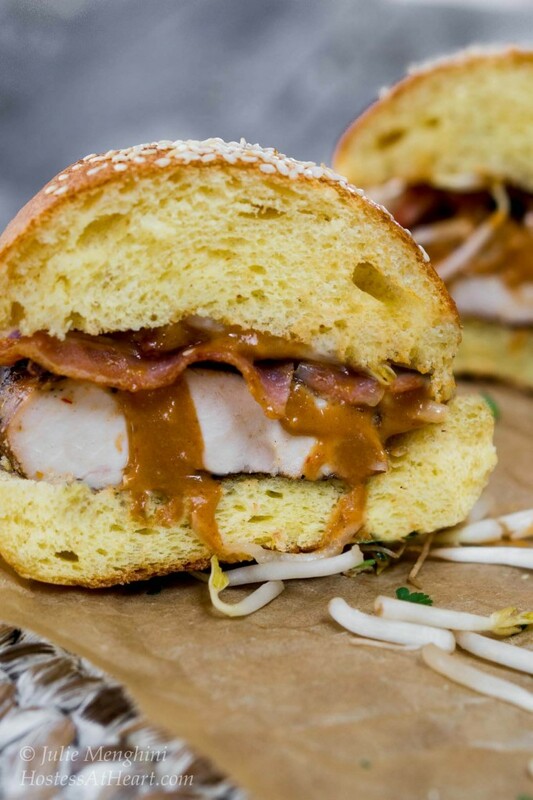 This whole sandwich is taken up a notch with the Basil Aioli. That sounds pretty fancy, doesn’t it? It is actually very quick and easy to put together. I blended fresh basil right into Hellmann’s® Real Mayonnaise which made a creamy delicious aioli that transformed this sandwich. 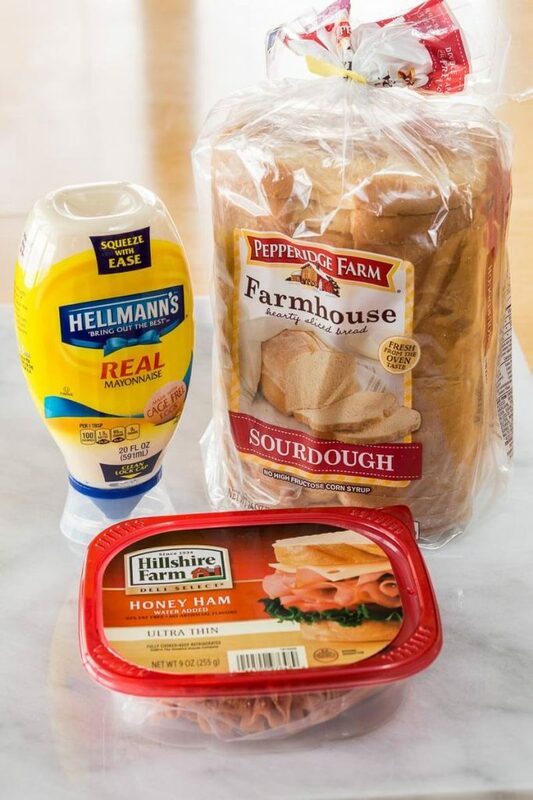 You can taste the freshness of the ingredients that Hellmann’s® Real Mayonnaise uses and I love the squeezable bottle that assures that I can use every last drop. This sandwich is sweet, salty, creamy, crunchy, and elevated with the flavors of basil and sourdough. I can’t think of a thing that I would do differently next time I make this sandwich! 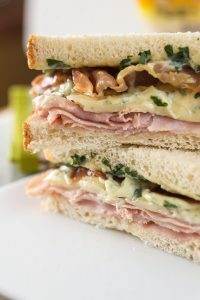 Ham, Melted Brie, Crispy Prosciutto Sandwich with Basil Aioli is a blend of textures and flavors that will tantalize the taste buds. Make the aioli by combining chopped basil with Hellmann's® Real Mayonnaise (I used a small food processor) and set aside. Spray a small skillet with non-stick cooking spray. Briefly, cook slices of prosciutto until crispy. 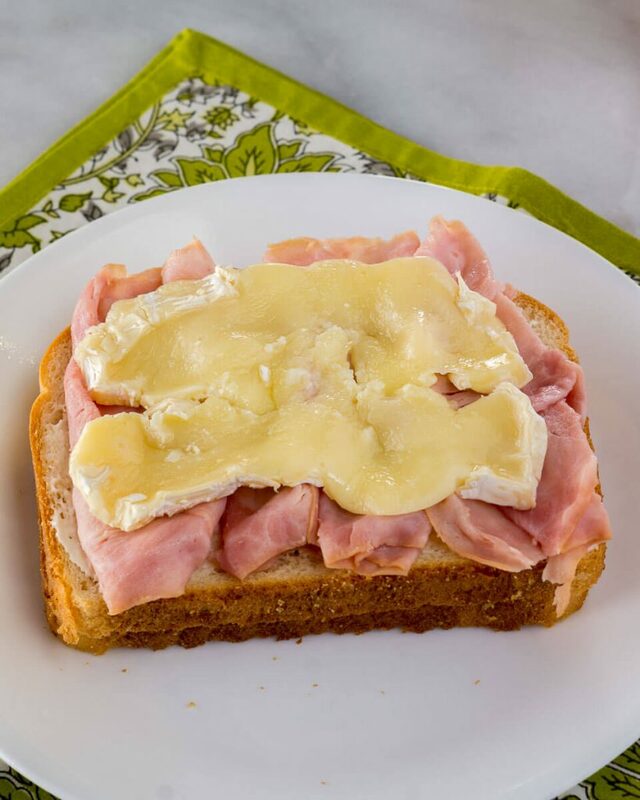 Top a slice of Farmhouse Hearty Sourdough bread with 4 slices of Hillshire Farms® Thin Sliced Honey Ham lunch meat. Top with brie and microwave for 10 to 15 seconds until melted. 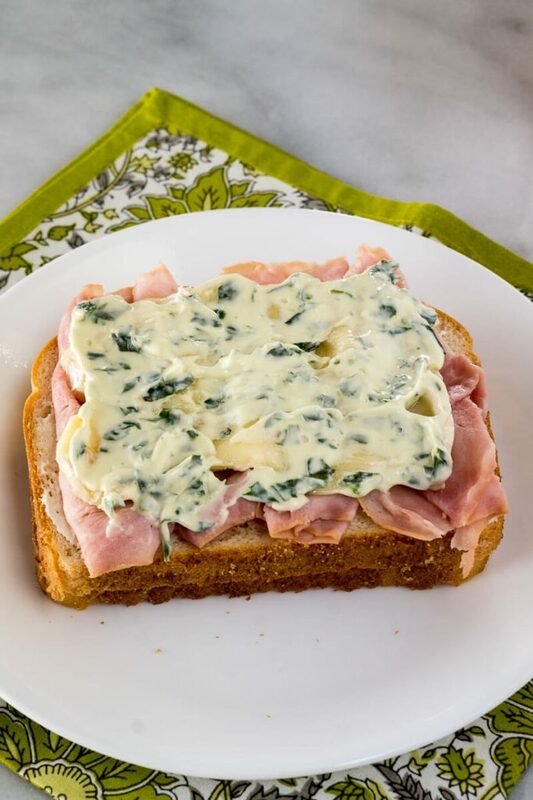 Spread with Basil Aioli and then prosciutto. Top with another slice of Farmhouse Hearty Sourdough bread. 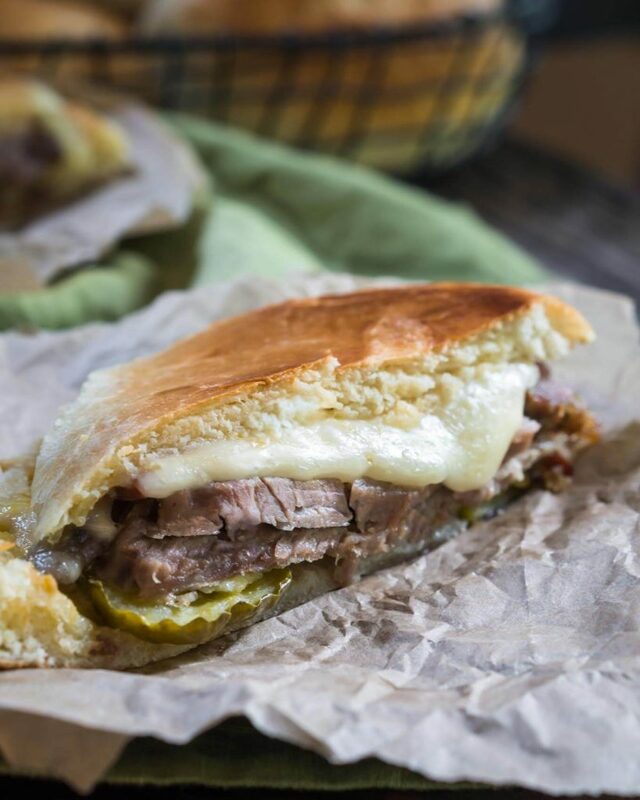 If you’re looking for a couple other great sandwiches, here are a couple of our favorites! Sweet, salty, and with a basil aioli? I’m in! Now if I couldn’t get a hold of fresh basil what’s the substitution for dried? Thanks Matt! If I couldn’t get fresh basil I don’t think I would use dried. You could use fresh tarragon which would be very good too. If you just don’t have a lot of fresh options, I would use a dried Italian or herb de province. Probably 1/2 teaspoon. Thank you, Amanda! We really enjoyed this sammie on Saturday for lunch. It’ll be a repeat that’s for sure. LOL Arl! You know I’d love to share a lunch with you! This sandwich is all that I’ve got to say. Oh yum! I love a good aioli and this tasty one sounds too easy not to give it a go. My hubby also loves this bread. I may have to make him this sandwich this weekend. Easy and quick sound good to me! Thank you so much! We loved it so much we had it for several lunches too. It is so quick and easy and that makes it all the better. John is a sourdough kind of guy and I must admit it worked really well on this one. I love the idea of basil in the aoli for a new twist on my sandwich…. I usually put tarragon in in mine, but have so much fresh basil at the moment I cant believe I hadn’t tried that. I use Hilshire Farms Ham often, because its such a healthy option to have in the house…. pairing it with prosciutto and aoli is a grand slam of a sandwich.,.. Thank you, Michele! Not having a ton of sweet basil is one of the reasons this climate drives me nuts. I wish we had it year around. Tarragon would be amazing too! I love it and just don’t use it enough. I really liked the Hilshire Farms Ham and have kept it on hand ever since. I’ll definitely be making this sammie again. What delicious flavors on this sandwich! First off, you had me at brie and prosciutto! And then the basil aioli sounds like perfection! 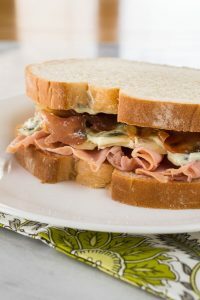 Nothing can beat a great sandwich for lunch, and this would fit the bill on so many favorite things! Lovely! Thank you so much, Leah! I love a good sammy and it would only be improved by one of gastronome blog’s cocktails! I love a sandwich with brie! 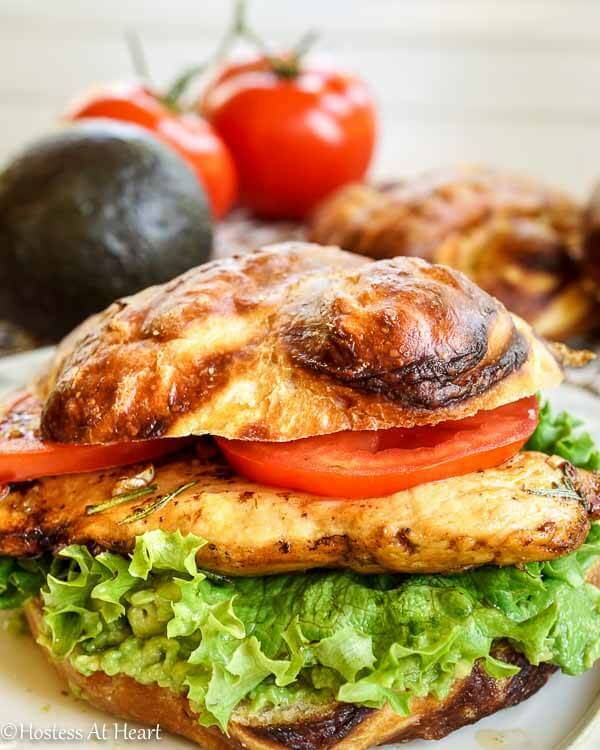 I love your flavors and textures, what a great sandwich Julie! Thank you so much Antonia! I love a good sammie too. Thank you for stopping by! YUM! That basil aioli is calling my name! What I wouldn’t do for this sandwich for lunch today!! Thank you so much, Annie! I have to admit that it was a heck of a lot better than the lunch I had today too. Need to make them again this weekend! Wow! So many flavors and textures! I too love sourdough and that melted brie cheese looks a-ma-zing! Thank you Ana! It was an easy and delicious sandwich! I’m with you Loretta. I’m ready to get outside and to ditch the jacket. It’s only 38 here today so have a ways to go. Thank you Nancy! It is sooooo goooood! 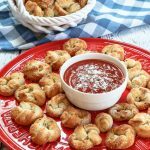 Basil makes everything even better! I love that incredible melted brie in there. This makes me so excited for spring picnics! Thank you Kelsie! I’m getting pretty excited about Spring too. And John and I were just talking about picnics. I love this kind of sandwich Julie but I would toast it in my panini maker and make what Oprah calls a “love sandwich”. It would have been even better like that Judi! Next time I’ll definitely try that. I vow to use mine more! Thank you Judi! Fabulous sandwich Julie, mouthwateringly delicious looking. Thank you Suzanne. It made a delicious lunch! Love this sandwich, especially with the basil aioli.